Sugar Acai Body Scrub with sugar fruit acids sweeps away dead skin cells and promotes cellular renewal to reveal softer, younger-looking skin. 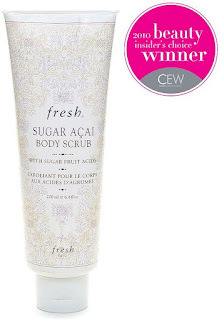 Gently scrub your way to great skin with Fresh Sugar Açaí Body Scrub ($48; fresh.com). The sugar crystals exfoliate, and açaí oil—made from the Brazilian superberry—delivers antioxidant benefits.